I'm going in for surgery again tomorrow. It's to fix a complication from the first one. That said, you'll be hearing less from me for a little while. I had to make the frog. I made a paper one right after it was suggested by Carolina on my Patriotic Pinwheels . He's been sitting on my desk taunting me ever since. I also have an extremely short attention span at the moment, and he didn't require much. On top of all that, I thought he was the perfect finale to my "Hey, isn't that supposed to be made out of paper?" series. These are typically made out of paper the size of an index card. 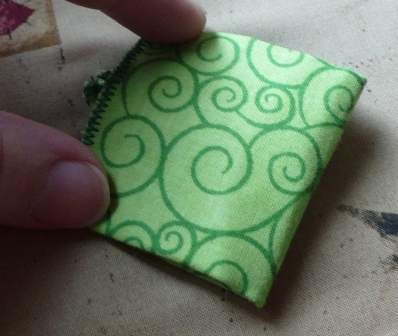 However, I wasn't sure the fabric would fold well at that size, so I went a little bigger. You'll need two pieces of fabric, each 4 by 6 inches. I used contrasting, then realized at the very end that you don't see the inside fabric at all. Also cut a piece of medium weight iron-on interfacing and a piece of fusible web to the same size. 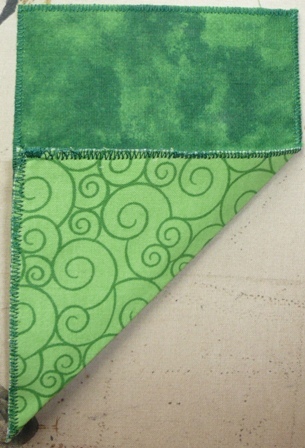 Iron the interfacing to the wrong side of one piece of fabric and the fusible web to the wrong side of the other. Peel the paper off the fusible web and iron the two pieces of fabric together, wrong sides together. 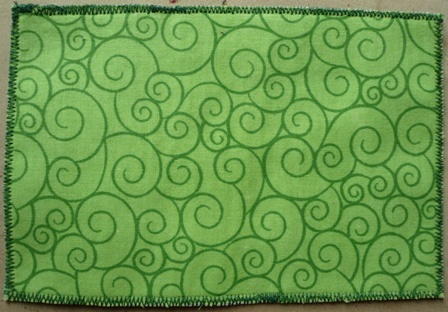 Stitch all the way around the edge, using a short, medium width zigzag stitch. 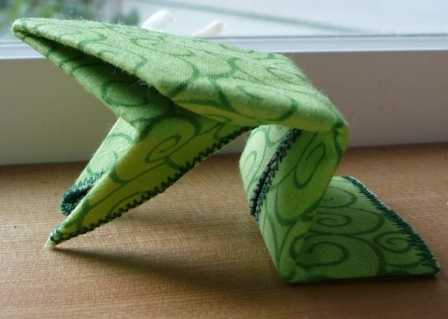 There are several folds required to make the frog. Press after each fold, using steam. Review each photo before making the fold - it's one of those things that's easier to show than tell. Fold one corner up until edges are even. Unfold, then repeat using the other corner. Unfold, turn so the previous folds are at the top, then fold top down as shown in photo, pushing the sides in as you press down. Fold both corners up to meet in the middle. 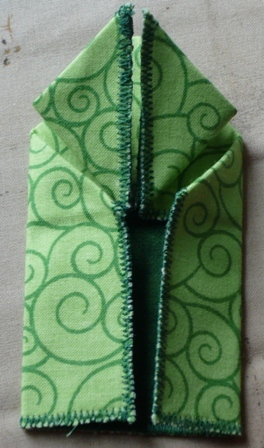 Fold sides in to meet in the middle. Fold bottom up even with the top. Fold edge down to meet bottom. Pick up, pull front legs down and allow back legs to unfold a little. 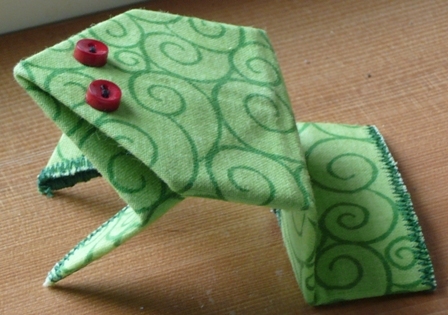 I felt he needed some eyes, so I unfolded him and sewed on some tiny buttons. You could also make a knot using embroidery floss, or draw some on using a permanent marker. The best part is, he will actually jump if you press down on his back and pop your finger off onto the surface behind him! After I've recovered, I'll move on to something else, something that didn't start out as paper...I promise.